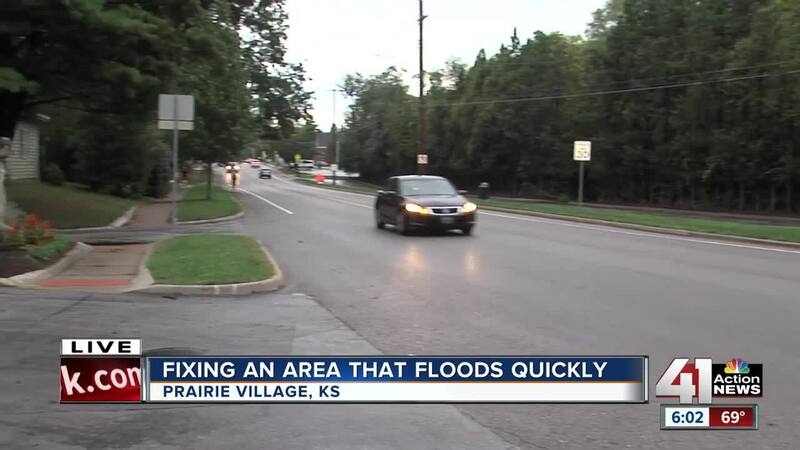 PRAIRIE VILLAGE, Kan. -- The city of Prairie Village has a plan to address flooding issues on Mission Road and 68th Street. The solution would raise Mission Road from Tomahawk Road to 67th Terrace to keep the waters from the creek on the east side of Mission from overflowing anytime there's a downpour. It's a $2 million project. The city is looking to get 75 percent of the funding through the Johnson County's SMAC program. The rest would come out of the city's general fund. Keith Bredehoeft, public works director, said officials are hoping to get the request filed in 2019 to receive the funding in 2020. Any time it rains a lot in a short amount of time, floodwaters rise over Mission Road and down into people's basements. Many of the homes along the stretch of roadway are in a floodplain. In 2017, Don Austin, whose own basement was flooded, rescued three people when their cars became stuck in the flood. This has been an issue for decades. "There's a natural kind of low spot in the road right at 68th Street. So, from just north of Tomahawk Road up to 67th Terrace, roadway would be flattened and raised, and some excavation into the channel on the east side as well would have to happen," Bredehoeft said. "The flood analysis of the hydraulic models have shown we’re not raising floodplain upstream or downstream, which is a requirement of a project like this." See the city's project study, including pictures of how the street would be raised, here .